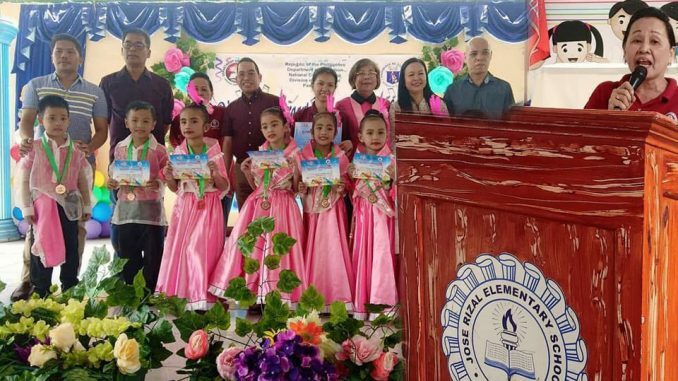 Geared towards strengthening the confidence and self-esteem of the Kindergarten pupils, 150 cluster winner-representatives have showcased their skills and talents in the Division Kindergarten Festival of Talents held on March 15, 2019 at Jose Rizal Elementary School. The annual conduct of the competition heightened the active participation of the young learners who contended for the first, second and third place in the following categories: Reading, Story Telling, Vocal Solo, Drawing and Dancing (Carinosa and Cha-cha). The winners in the following categories were awarded with trophies, medals and certificates: Story Reading:1st Place-Cluster 6,2nd Place-Cluster 7,and 3rd place is Cluster 1,Story Telling:1st place-Cluster 6,2nd place-Cluster 5 and 3rd place is cluster 3,Vocal Solo:1st place-cluster 3,2nd place -cluster 6 and 3rd place is cluster 2,Drawing:1st place-cluster 1,2nd place-cluster 3and 3rd place-cluster 7,Dancing(Carinosa):1st place-cluster 7,2nd place-cluster 3 and 3rd place is cluster 2,Dancing(Cha-cha):1st place-cluster 3,2nd place-cluster 7,and 3rd place is cluster 6. Behind the selection of the winners are the distinguished judges: Ms. Evelyn Ramos, Ms. Fe Llanes, Ms. Mary Jane Mejos, Mr. Carlos Belicano and Mr. Omar Aguilar. Credits for the success of the said event is due to the people who have given their full support: Dr. Evangeline P. Ladines, Schools Division Superintendent, Mr. Librado F.Torres,Chief Education Program Supervisor, Dr, Azucena Evardone, PSDS in- charge in Kindergarten, School Heads, Kindergarten Teachers, Parents and the Stakeholders.